Comic publishers will sometimes have their own little imprint. It like a sub-company that falls under the ownership of the main entity, but also operates somewhat independently, from practically being its own company (like Boundless) to being solicited as a part of the main publisher's goods, but with its imprint-logo prominent (like Marvel's now-mostly-dead Icon stuff). This year there was an imprint announced which sounded like it was loaded with potential, and I'm pleased it seems to so far have delivered exactly what I hoped for. Gerard Way is known by many for his music as part of the band, "My Chemical Romance." I have never really listened to the band but I am a big fan of his comic-work. When he started-up, "Umbrella Academy," at Dark Horse I thought it would be another comic supposedly, "Authored," by a celebrity who just slapped their name on something ghost-written by someone else. How wrong I was. Way has always loved comics and turned in something amazing with, "Umbrella Academy." 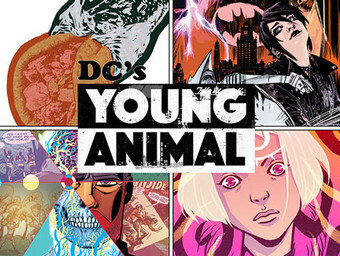 He has continued to do the occasional cool piece of work but the coolest thing was learning how he was in charge on a new imprint at DC called, "Young Animal." Basically like a new version of Vertigo (which still exists, barely), "Young Animal," is a mixture of cool older properties ("Doom Patrol") and new stuff as well ("Mother Panic"). The creative teams are quite snazzy (with Way himself providing the writing on the newly-relaunched, "Doom Patrol,") and the subject-matter has a cool and exciting edge to it in every book--after all, the imprint's slogan is, "Comics for Dangerous Humans." It is a bit early-on to say with a definitive, "Yes," if the Young Animal books will continue to be awesome and/or will last a decent amount of time. As it is now though, they are very cool comics, and I hope they keep coming out well into the foreseeable future.